People can say what they want about Martha Stewart but she has some great recipes. My mom bought me a couple of her cookbooks, well, let's just say a while ago. My favorite one to this day is Entertaining because of the wide variety of recipes including this one for sugar cookies and her pie crust recipe. 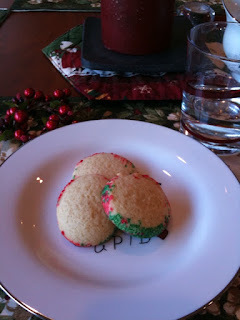 I use this recipe for Christmas, Valentine's and Halloween; any excuse to make a rolled sugar cookie. The original recipe called for brandy which I don't have on hand so I substituted more vanilla. I also increased the salt because I like the contrast in flavor. If you don't think you have time to make a rolled cookie, I encourage you to try this. As long as your butter is soft, it's done in less time than it takes to probably drive to the store. Plus, the flavor is just wonderful. If the butter is not soft, you can soften it in the microwave using a defrost setting. Check it every 15 seconds. When the cookies go in the oven, set the timer for 5 minutes. Rotate the pans top to bottom; bottom to top and set the timer for another 4 minutes. At the end, the cookies bake quickly. Cookies should be light brown on the edges; otherwise they will be too crispy. 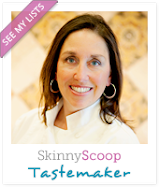 Check the blog entry about baking ingredients to learn about which ingredients are best. Use a stand mixer like a KitchenAid or hand mixer to cream the butter. It's hard to do this by hand. When rolling out dough, use flour on both sides of the dough, top and bottom. Turn dough over and around to ensure it doesn't stick. I hope you like this and will try it. Leave me a comment if you do. Also, if you buy anything through the highlighted product links on amazon.com, it helps to fund this blog as well as a local education fund. Thank you in advance! 1. Mix flour, salt and baking powder in a bowl with a whisk. You can sift but I have found that the results are still excellent even if you don't. 2. In a stand mixer fitted with a paddle attachment (or a bowl using a hand mixer), cream butter for 2 minutes until fluffy. Add sugar and beat until light and fluffy. 3. Add the vanilla and egg and mix until blended. You may need to turn the mixer speed to about medium to do this. You don't want to do this when you add the flour, though; otherwise the cookie can turn out tough. 4. Once vanilla and egg are incorporated, add flour in 3 additions; about 3/4 c and then mix on low. Repeat that two more times until dough comes together. Use your hands to form this into a disc (this is easier to roll) and cover with plastic wrap. It might be necessary to put some flour on your hands to do this. 5. Refrigerate dough about 30 minutes or up to 3 days. You can also freeze for 15 minutes if you are short on time or freeze to use in the future. If you do the latter, defrost in the fridge the day before. 6. Preheat oven to 375ºF (Martha suggests 400 but I found it was too easy for the cookies to become very brown). Roll out dough on a floured board and using a cookie cutter that's been dipped in flour, cut out shapes and place on buttered cookie sheets or on a cookie sheet with a silicon mat. 7. Bake cookies for 8-10 minutes, rotating halfway through. Cookies should be light brown on the edges. Keep on tray for 3 minutes and then transfer to a wire rack (this is really an important step). 8. For an easy glaze, mix 1 cup of confectioner's sugar with 1 Tbl cold water. Use this type of glaze to enable sprinkles to adhere. I am amazed that people think I never make mistakes in the kitchen. Recently, while making cookies for school, I misread my own recipe and added 2 eggs instead of 1. I realized only after the second batch was made. I thought that maybe it could be fixed with some extra flour but decided to not take a chance and test it out myself. The result was a good tasting cookie but almost more like cake. It was fluffy, not crisp. And, it was definitely too sticky for rolled cookies. 2 batches of new sugar cookie dough later and I think I learned my lesson. When I told my friend this story, she was happy to hear I'm not perfect (I don't think that either!). She did, however, ask me to write about how I was able to recover the mistake. There are times when it's not possible. In one class that I taught earlier this year, someone added 2 cups of sugar to a scone batter instead of 1/4 cup. Yup; couldn't fix that one but I tried. Anyway, it got me to thinking that understanding what the ingredients do is very important. When I bake, I use certain ingredients which inevitably affects the flavor and texture. I also realize that I don't always specify which ones I use in my recipes. Here's a breakdown of common baking ingredients with my preferred type and why. Flour: I use unbleached white flour when I bake pies, sugar cookies and pastry; anything light in color. Flour that is bleached naturally as it ages is labeled "unbleached," while chemically treated flour is labeled "bleached." Ok, why would I want to use something that is chemically treated? Check the labels. I use whole wheat pastry, white wheat flour (milled from a white wheat) or sometimes just wheat flour for things like pancakes, waffles, muffins (unless it's light, like apple or blueberry), and dark cookies like ginger or oatmeal. Often I use half white and half wheat just so that it's not too heavy or dry. Sugar: In most recipes, you can reduce the amount of sugar by 25%. If a recipe calls for 1 cup of sugar, try 3/4 cup next time and see what you think. There comes a point where a recipe may not have enough sugar so test it. I have been buying organic white sugar for a couple of reasons. It has not been genetically modified so I look at it as being more "pure" as well as the fact that it has not been subjected to pesticides. I buy it in bulk which saves money on packaging. When I use it in a recipe, I notice the dough is not as light; almost beige. After it's baked, though, you can't tell the difference and if anything, the flavor is better. People often ask "What can you use in place of sugar?". Well it depends upon the recipe. I learned my lesson to not substitute sucanat (Sugar Cane Natural; similar to brown sugar) in a recipe for a lemon tart. It looked like a pecan pie. But in most recipes, you can use less sugar and use other natural sweeteners. For example, if a muffin recipe calls for 1 cup of sugar, I would likely use 1/2 cup of sugar and 1/4 cup of brown rice syrup or agave nectar. If it's a pumpkin or carrot recipe, I may only use brown sugar with either of the sugar options. All of these have calories but some sweeteners are easier for our bodies to process. Plus, because they are sweeter, you can use less. Don't be afraid to play with the sugar in a recipe; unless you are baking for a special occasion. Save testing for your family or friends who enjoy experiments! Butter: The only time I use salted butter is for toast. Otherwise, everything I bake or cook with is unsalted. I also try to use only organic or at least from a source like Clover. You can substitute oil for butter in many recipes. Some people don't like canola oil because of the way it is processed. I'm moving back to natural ingredients and use butter in baking. Besides, it just tastes so good! Chocolate: There are many opinions of chocolate out there; I know. When it comes to baking, use the good stuff like Ghirardelli, Guittard, or Scharffen Berger. Yes, it's expensive but worth it. Baking Powder versus Baking Soda: Both of these ingredients are used for leavening. Baking Powder is a combination of baking soda, one or more acid salts like cream of tartar and some type of starch. If a recipe calls for baking soda, you can use baking powder but not the other way around. Baking soda is much stronger than baking powder, about four times. It reacts with the acid in an ingredient in a recipe like yogurt, lemon juice or chocolate. It begins to react as soon as it is mixed with liquids so make sure to bake the batter immediately. When both are used in a recipe, the baking powder does most of the leavening. The baking soda is added to neutralize the acids in the recipe plus to add tenderness and some leavening. Too much baking powder can give your cake, cookie or waffle a bitter taste. This is why you can't always double or triple recipes. Most times it's better to make the recipes one at a time. Anything else? I think I covered most of it. Oh, yes, make sure to add salt to your baked goods. It does make a difference. 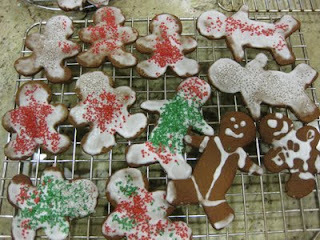 While making a batch of gingerbread, I realized that my post for decorated gingerbread cookies was made on Dec 29 of last year. Since we are in the swing of the holidays (and I've gotten numerous requests for this recipe), I am reposting. The recipe below can be found on my friend Amy Andrew's blog here; I am copying it so that the recipe and directions are in one place as well as the fact that I made a few changes and added some comments. Although I was never a big fan of gingerbread, I have to say that I have acquired a taste for it. Using wholesome ingredients like whole wheat flour and brown rice syrup makes it a bit easier to rationalize as well. Try the super-easy recipe for the icing as well. Happy Holidays! 1. Mix flours, ginger, cinnamon, baking soda, cloves and salt in bowl. 2. Cream butter first, then add sugars and molasses, making sure to scrape down the sides. Beat until fluffy. Beat in the eggs until well blended. 3. Add dry ingredients and mix to combine, being careful not to mix very much. Dough will be soft. 4. Lay out 3 sheets of plastic wrap and place 1/3 of the dough in the middle of each sheet. This is an important step because the recipe makes so much. If you only use 2 discs, you may not be able to roll it thin enough. Pat into a disk shape and wrap in plastic. Chill dough until firm, at least 1 hour and up to 3 days. 5. Preheat oven to 375ºF (or 350ºF Convection Bake). Roll out one disk of dough at a time on a lightly floured surface to approximately 1/4 inch thickness. Dip cutter into a little pile of flour on your work surface then cut dough shapes and transfer to parchment lined baking sheet. 6. Bake 8 - 10 minutes, rotating the pans halfway through the baking time. Leave on pan for 5 minutes then transfer to racks to cool. Gather scraps and re-roll. Try to reduce the amount of time rerolling or the cookies will be tough (but will still taste good!). Place icing into a plastic ziploc bag with the tip cut off. This makes it very easy for little hands to decorate! I know there is a fancier way to do this but for me, I like easy. I just mix sugar and water to create a paste. 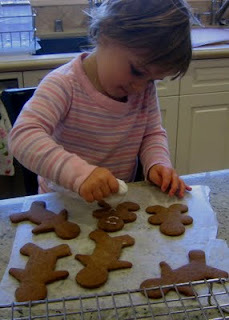 It dries quickly and allows children to decorate the gingerbread men with candies, sprinkles or non-parels. Once you are ready to decorate, mix 1 cup of confectioner's sugar with 1 Tbl cold water with a whisk. Keep covered until ready to use. Brush onto cooled cookie with a pastry brush. 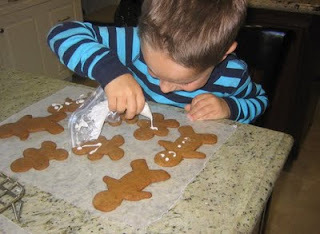 You can also place the icing in a ziploc bag with one corner cut off and squeeze out. Immediately add sprinkles. Allow to dry for at least 30 minutes. Enjoy! I was working on my cookbook today on the "How to Sauté" chapter. The accompanying recipe was for an Italian chicken that can be sautéed or grilled. I thought it best to test it while it was still fresh in my mind. I like buying chicken that is not raised with antibiotics, animal-products or hormones and have found the quality of smart chicken to be very good. Yes, it is more expensive but when I opened the package, I was appreciative that it did not need to be trimmed at all. That just saved me 10 minutes as well as the clean up; thank you. I did something I hadn't done in a while which was to pound the chicken. I usually skip this step but thought it might be fun to get the children involved. So, into a ziploc bag went the chicken and out came the meat tenderizer. Surprisingly, no one was hurt and the result was uniform chicken breasts. We then made the seasoning mix together (of course, everyone had to help measure) and the rest was easy. I would love it if you would give the recipe a try and provide some feedback. 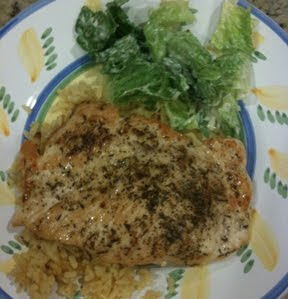 I'll post the recipe for the saffron rice and the Ceasar dressing (which is what I served it with) soon; promise. Thanks! Season the meat with your selection of herbs and spices. Heat the pan first until hot. Add a little oil, then the meat. Make sure to hear the sizzle and adjust the heat if necessary. Then, step away from the stove! Do not move meat in pan. Turn meat over to cook other side. 1. Mix herbs, spices and salt in a small dish or ramekin. Sprinkle half over chicken. 2. Heat pan to medium or medium high. Once the pan is hot, add the oil and quickly place the chicken in the pan, seasoning side down, being careful not to crowd the pan. Cook in batches if necessary. 3. Do not move chicken in the pan. Sprinkle remaining seasoning on other side of chicken. Adjust heat if necessary so that you can hear the chicken cooking but it’s not burning. 4. Once chicken is browned and beginning to turn white on the sides (you will be able to see and smell this), turn over and cook on the other side. Again, do not move around in the pan and try not to over cook. 5. Cooked chicken will be firm when you press it. If it’s not done, it will feel soft in the middle. Try to resist the temptation to cut into it; you’ll lose a lot of the natural juices. If you want it to cook a little longer, place on a plate and cover. It will continue to cook for a few minutes. 6. 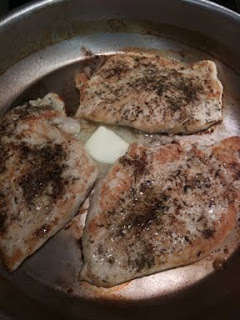 Once chicken is cooked, you can deglaze the pan by adding 1/4 cup white wine or the juice from 1/2 fresh lemon. Let that cook for 1 minute, remove from heat, then add 2 Tbl unsalted butter. This creates a quick and delicious sauce. I did this last year for a party and managed to take a picture before they were eaten. It takes about an extra 5 minutes to take regular brownies and make them just a little fancier. You can buy pre-made brownie bites or make your own. 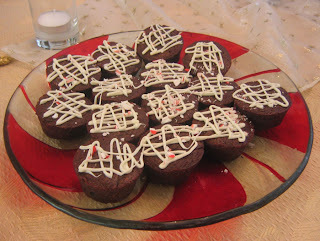 I posted a recipe for "Better than a Box" brownies earlier this year.Use that recipe but bake them in mini muffin tins. Bake in a 350ºF oven for about 14-18 minutes. Basically, anytime you change from a larger size to a smaller size (e.g. muffin to mini muffin, cake to cupcake), raise the oven temperature 25 degrees. 1) Find a nice platter and remind your husband not to put it in the dishwasher if it's not supposed to go in it. Let's just say now I have a nice round glass platter without stripes. 2) Arrange brownies on a baking tray or on top of some foil or waxed paper. You don't want the nice platter with streaks of chocolate (or maybe you do!). 3) Melt about 1/2 cup of white chocolate chips in the microwave. I like the Ghirardelli ones. Heat on high for 30 seconds at a time, stirring in between, until melted. 4) While chips are being melted, take a candy cane (or about 4 small or 6 round candies) out of it's wrapper and place in a plastic bag . Put that on a cutting board. 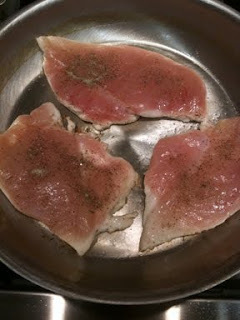 Using the flat side of a meat tenderizer or a heavy pot/pan, crush the candies into little pieces (the meat tenderizer is great for making chicken or pork cutlets very flat and even). 5) Take melted chocolate and place in a ziploc bag. Try using a rubber spatula to get every last drop. Cut the tip of one of the bottom corners of the bag. Pipe out chocolate in lines in one direction and then in another direction. 6) Sprinkle candy over melted chocolate. Don't wait too long. If the chocolate hardens, the candy won't stick. 7) Arrange on pretty platter from step #1. Remind husband about the dish. This should be enough for about 24 brownie bites depending upon how much chocolate/candy you use for each one. Better to have some extra chocolate and candy canes...just in case!